The same mapping as in the base class. Option to set user defined colors for the min and max value. Definition at line 140 of file CColorScale.h. Definition at line 127 of file CColorScale.cpp. 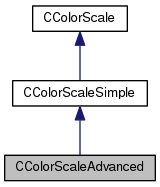 Definition at line 144 of file CColorScale.cpp. References C_FLOAT64, mColorMax, mColorMin, CColorScaleSimple::mMax, and CColorScaleSimple::mMin. Definition at line 139 of file CColorScale.cpp. Definition at line 134 of file CColorScale.cpp. Definition at line 154 of file CColorScale.h. Referenced by CColorScaleAdvanced(), getColor(), and setColorMax(). Definition at line 153 of file CColorScale.h. Referenced by CColorScaleAdvanced(), getColor(), and setColorMin().